Nongoma - More than 20 million South Africans live in areas that have kings or traditional leaders, who are a link to their ancestors. But there is growing disenchantment over their taxpayer-funded lifestyles and alleged abuses of power. Traffic stops in Nongoma as South African Zulu King Goodwill Zwelithini passes through his bustling capital in a Mercedes-Benz. The 66-year-old is the most influential among South Africa's 11 regional monarchs. Photographs of him, clad in leopard skins, adorn local tourism offices. "He makes me feel proud of being Zulu," said George, 57, a taxi driver. While kings and chiefs are revered by some, there is also growing discontent as they are seen as living well at taxpayers' expense, and plans to reinforce their powers have been criticised. The country's 10 kings and one queen get an annual salary of R1.3m each from the state. In addition, Zwelithini gets more than R50m from the KwaZulu-Natal government for the upkeep of his seven palaces, six wives and 28 children. Other monarchs, who come from less powerful dynasties, get benefits such as vehicles or mobile phone allowances. 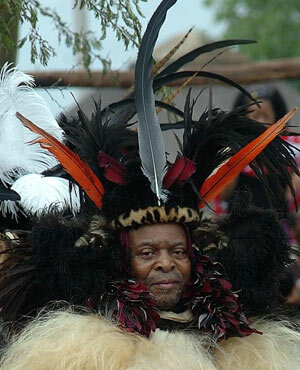 Zwelithini descends from the brother of 19th-century king Shaka, the founder of the dynasty, who united the northern part of what is now the province of KwaZulu-Natal, according to historian John Wright. The British defeated the Zulu kingdom in 1879. But the Inkatha Freedom Party, representing many Zulus, still made a bid for their autonomy in the second half of the 20th century. Zwelithini, a figurehead leader for South Africa's largest ethnic group of 11 million people, presides over the annual opening of the provincial parliament. He weighs in on provincial and local decision-making, travels to promote trade, and mediates in disputes. He stages traditional ceremonies and reintroduced male circumcision to fight Aids in 2010, leading to more than 70 000 Zulu men getting circumcised. Nongoma is dotted with the palaces of royal family members. They often include a main building and traditional-style circular buildings with grass roofs, with cattle grazing outside. "I like it that we have a king. But he is greedy. He spends money that could be used to help poor people," said Goodwell, 39, a construction worker. Those in favour of the kings say their spending is modest compared to that of European royalty. Zwelithini's palaces are in need of renovation and the royal family has set up a trust to help cover its expenses, his cousin Prince Thulani said. The state also pays the salaries of 829 senior traditional leaders -often called chiefs in English - wielding power over smaller groups, and, of 7 399 headmen or headwomen helping to run one or several villages. More than 20 million of South Africa's population of 53 million live in areas that have kings or other traditional leaders. Their tasks range from launching development projects to heading traditional courts, which handle local cases on the basis of customary law, and issuing reliability certificates for instance to people opening bank accounts. "Traditional leaders are important for people's identity and roots. They form a link to the ancestors," said Welile Khuzwayo, research director at the Traditional Affairs Ministry. The controversy surrounding traditional leaders extends beyond what they cost the state. Critics say the existence of a body of unelected officials is incompatible with democracy. A bill that would have placed traditional courts on an equal footing with regular courts was postponed in February in the face of widespread opposition from provincial authorities. There was concern that it would have made it easier for traditional leaders to commit abuses such as ordering people to work on their fields as punishment, or taking away land from families inhabiting it for generations on the grounds that it is communally owned. The government is planning additional legislation that Khuzwayo says would only introduce "cosmetic" administrative changes and recognise the rights of the indigenous Khoi-San people. But Mbongiseni Buthelezi, a researcher with the Centre of Law and Society at Cape Town University, says it would enshrine the powers of traditional leaders more firmly in law. Land issues loom large in the complaints against traditional leaders. In KwaZulu-Natal, a trust presided over by Zwelithini is custodian of about 30% of the land in the province. Buthelezi says there is anecdotal evidence that some of the people living on that land have been forced out to make room for coal mining companies. Critics of traditional leaders also say some of them were given their posts for collaborating with the 1948-94 Apartheid regime, and that they stand for patriarchal values, allowing women to be represented by male relatives in court or when acquiring land. President Jacob Zuma, a Zulu traditionalist with four wives, has strongly backed traditional leadership. The ANC is losing support in urban areas, and empowering traditional leaders "can be seen as a way for the party to consolidate its rural power base," said Francis Antonie from the Helen Suzman Foundation, a liberal think tank. "The king is God's representative on Earth, but I don't like it that he has so many wives," said Slindile, a Nongoma waitress in her 20s.